Whether you're interested in an infrared sauna for sale, a traditional indoor one or an outdoor model, your best bet these days is buying it online, simply because of the amount of choices and the great prices. Because online merchants don't need a huge showroom and all of the expenses that come with it, they are able to offer prices that are a fraction of what they would be, meaning you can get a brand new home sauna for the price of a used one. What About Buying a Used Sauna? Many people looking for a sauna for sale are considering buying used, and that's not the best option for many reasons. For starters, there could be issues that you don't come across until it's too late. Maybe the heating element(s) are faulty, perhaps some of the paneling is coming apart, or maybe there are issues with the bench or the glass or the control panel. You just don't know what you may find, and the warranty might be out of date or not apply to the new owner of the sauna. On top of this you have to deal with the added shipping cost, or arrange for a pickup locally which might be problematic. Sure, if you're buying a sauna from a good friend or family member, these may not be concerns...but going through eBay or Craigslist could lead to issues that you may not be able to resolve. So we recommend buying new if possible to avoid all of these issues. The extra few hundred dollars is well worth it to avoid serious problems down the road. So Where Do You Find the Best Deals? When it comes to finding a sauna for sale, start by figuring out what your budget is. 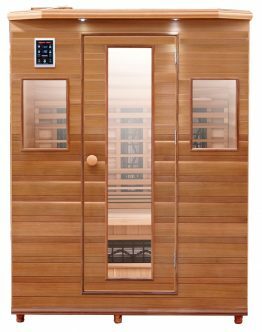 If you're in the market for an infrared sauna there are many options in the different price ranges. The cheaper ones are not as well built as the more expensive ones, nor will they provide the same benefits, but if that's what your budget is, there are some good options for you. Once you have your approximate budget, you'll be able to see what is available out there for you. My budget is around $1000....what can I get? If you're under $1000, you're looking at either portable saunas or very low quality regular ones, whether they are infrared or traditional (indoor or outdoor). You can find these at Wayfair or Walmart, but the best selection is available at Amazon. My budget is around $2000....what can I get? Between $1000 and $2000, you can get a very high end portable sauna from a reputable brand or a larger sized sauna from an OK brand. My budget is around $3000....what can I get? If you're over $3000, you can get one of the larger units from these companies, ones that can accommodate more people and offer additional features and capabilities. What About Traditional Indoor/Outdoor Saunas For Sale? If you're not looking for an infrared sauna for sale, but rather a traditional one with a stove for indoor or outdoor use, we recommend Saunacore, one of the most respective names in the industry. If this is the case, contact us and let us know exactly what you are looking for and we'll put you in touch with someone who will take care of you. Finding the ideal sauna for sale is much easier these days with the variety of choices you have online. Whether you have $1000 or $10000 to spend, there is a model out there that will suit your needs.